Take Dora wherever you go! Check image gallery for various adorable poses available to clip on to your backpack, lunch bag, gym bag, jacket and more! 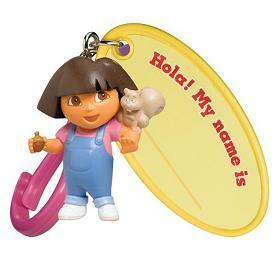 Each Dora clip on is extra special with a name tag to identify your favorite things. Never leave home without Dora! Product and decoration may vary. Nickelodeon®, Nick Jr.®, Dora the Explorer Princess® and all related titles,logos and characters are registered trademarks owned by Viacom International, Inc.
My Little Pony keychain - Four different My Little Pony's have arrived in Ponyville! Small and ready to go with you on your backpack or in your pocket!